Good Morning.. We'll my post didn't go live as scheduled yesterday, sorry about that. Im using two of the latest sets from the Alley Way Stamps today. I stamped the polk dots from the background set Point of View and heat embossed them in Gold and then I added a nest of Gold thread with a mini glue dot. I adhered the panel to a Cherry Cobbler card base. Then I stamped the sentiment from Happy Everything onto a piece of White card stock and heat embossed it in hold and trimmed it into a banner shape and adhered it with dimensionals. 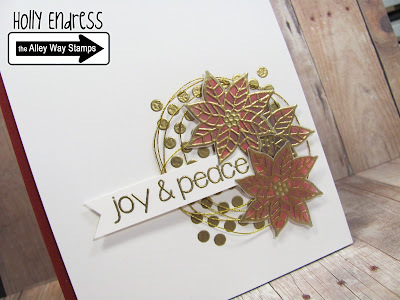 I stamped a few of the poinsettias from Mistletoe Kisses and heat embossed them on some Vellum. I added a touch of color on the backside with a Copic. I cut them out and added them with some mini glue dots. I love the combo of the Cherry and Gold colors together. Head over to the Alley Way Stamps blog for more inspiration from the Design Team!